Writing development begins in infancy and continues through childhood. Handwriting and imagination is key to helping us store information, communicate to others, and plays a big part in educational development. Writing and using your imagination enhances a greater love for reading and expands creativity. Learning to write fluidly promotes greater cognitive, linguistic, and motor expression, as well as builds self-esteem. Are you ready to have fun and explore? Grab your pencils, markers, and crayons, and come along on a magical journey filled with adventure creativity and imagination. 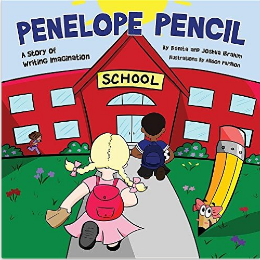 Join characters Ahna, Josh, and Faith as they learn, grow, draw, and explore in the adventures of Penelope Pencil. I loved the imagination that was put behind Penelope. the creativity and wonderment that book invokes is exactly what children need in todays world. kids have become so accustomed to video games, TV, and media; this is bringing kids back to the basics and back to a time when creativity was fun. I love this book! Reading it with my kids is so much fun watching them use there imaginations! My oldest is starting to remember the words to the story and try’s to read it to her younger sister!